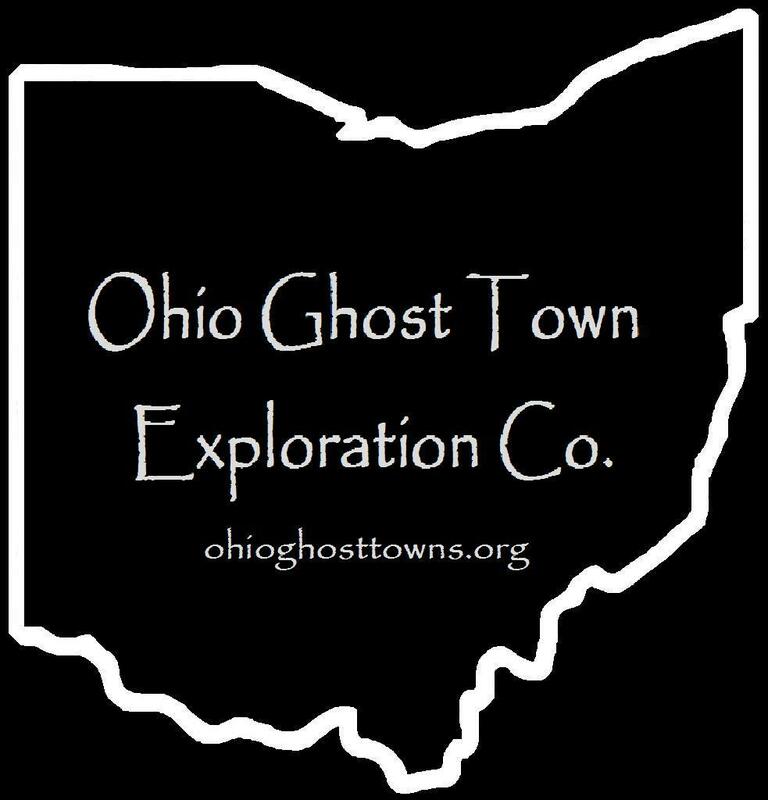 Wood County – Ohio Ghost Town Exploration Co. Description: David Hedges (1782 – 1860) built a saw mill & platted the town, naming it after the nationally famous politician Thomas Benton (1782 – 1858). Shortly after that, Emerson H. Eaton opened a general store in Benton & Alexander Alcorn (1812 – 1873) owned a chair shop. Alexander was buried with relatives & other early pioneers in Washington Township Cemetery on Range Line Rd along West Branch Tontogany Creek between Scott Rd (Township Hwy 217) & Kellogg Rd (Co Rd 184). Benton was mentioned in the 1897 county history book & had long since disappeared before its publication. David Hedges was laid to rest with relatives in Wakeman Cemetery on the south side of Farnsworth Rd in Waterville, Lucas County. Description: Its proprietor & postmaster, Justus Stearns (1810 – 1888) from Allegheny County, Pennsylvania, accumulated over 700 acres of land after moving to Perry Township in 1851. As the Toledo & Ohio Central Railroad (later bought by the B & O Railroad) was being constructed through the area, Justus & a couple of his sons intended to start a town around the GPS coordinates with plans for a hotel, several merchant shops, & bringing in manufacturing industries. They bit off a bit more than they could chew so to speak, & ended up cancelling the venture as debts began to pile up. A couple of decades later, the area turned into Norris Station with Civil War veteran Omar P. Norris (1838 – 1929) from Wayne County as the town’s proprietor & owning a steam-powered saw mill on the south side of Eagleville Rd at the intersection of Birch Rd. There was also a school (Perry Township No. 5) on the north side of Eagleville Rd east of Birch Rd. Although the town was called Norris Station at the time, the train station’s name was Koons. Justus Stearns was married 4 times & had 17 children. He was buried with relatives in Weston Cemetery on the east side of Van Tassel Rd in Weston Township. Omar Norris was buried with relatives in Fostoria Fountain Cemetery about 5 miles south of town on SR 18 (Van Buren St) in Hancock County. Description: The town was founded by Dr. Lewis H. Cass (1823 – 1898) from Wayne County & Amanda (Loveland) Cass (1825 – 1908) from Delaware County. They had 8 children & opened a general store near the intersection in 1868. Mt Zion Church was constructed in 1875 at a cost of $2,205. A school (Liberty Township No. 7) was northeast of the GPS coordinates in the southwest corner of the intersection of Powell Rd & Rudolph Rd on land owned by the McMahon family. Lewis & Amanda were buried with relatives in Weston Cemetery on the east side of Van Tassel Rd in Weston. Description: It had a train station on the Columbus, Hocking Valley, & Toledo Railroad & grew around a saw mill built by Giddings & Cummings. Frederick S. Giddings (d. 1913) was the postmaster. The town also had a stave factory, which was the site of an explosion in 1891, & a general store. Cummings fell into obscurity in the early 1900s. Description: Around the time the Coldwater railroad was being build through the area, Robert W. McMahan (1842 – 1911) opened a general store & J. D. Haley owned a grocery & drug store. Robert was buried with relatives in Portage Cemetery on the southeast side of County Home Rd in Portage Township. Description: It was a small oil boom town on the Cincinnati, Hamilton, & Dayton Railroad in north of Hammansburg in Henry Township & was named after a branch of the Eberly family in the county. Wood frame cottages for the workers lined its main street. Description: French immigrant Joseph Durliat (1831 – 1889) was the town’s postmaster. He married Magdalena (Trendall) Durliat (1838 – 1921) in Canada in 1856. They moved to Ohio in 1865, donated land for tracks for the Dayton & Michigan Railroad (later the Cincinnati, Hamilton, & Dayton), & owned a steam-powered saw mill on the east side of the railroad tracks. There was also a school on the west side of Roundhead Rd near the GPS coordinates. Joseph & Madgalena had 10 children & were buried with many descendants in Saint Louis Cemetery 4 miles northeast of the GPS coordinates on the south side of SR 281 (Defiance Pike) in Custar. Description: Fenton was once an important trading center in Webster Township, but missed out on the railroad boom & eventually couldn’t compete with towns such as Dowling & Dunbridge. It was founded by John Fenton (1792 – 1867) & Elisabeth (McGowan) Fenton (1793 – 1873) who arrived in the township in 1833 – 1834 along with a large group of Scottish immigrants. They owned a general store & John was the first postmaster. The town had a steam-powered saw mill on the east side of SR 199 south of the GPS coordinates. School was originally held in a log cabin until a new one-room structure (Wesbter Township No. 1) was built on the east side of SR 199 north of SR 582. There were a few other postmasters & store owners after John passed away. English immigrant Isaac Dent (1848 – 1929) & Martha (Emmitt) Dent (1852 – 1941) from Huron County kept it going during its last 11 years. Issac served as a school district supervisor & superintendent. Everyone mentioned in this listing was buried with local pioneers in Scotch Ridge (Webster Township) Cemetery about 3 & 1/2 miles south of the GPS coordinates on the west side of SR 199. Description: The town was founded by English immigrant & Civil War veteran William Haney (1818 – 1908) & Frances (Howes) Haney (1821 – 1893). They got married in 1852, had 3 children, & were buried with relatives in Milton Township Cemetery about 6 & 12 miles northwest of the GPS coordinates on the east side of Custar Rd. A tile works owned by the Lovell family was on the east side of Range Line Rd south of the GPS coordinates. There were 2 steam-powered saw mills in the area, one on the north side of Jerry Rd just west of the intersection in Milton Township on land owned by the Goit family, & another in Liberty Township on the east side of Potter Rd north of Jerry City Rd on land owned by the Roush family. A school (Jackson Township No. 1) was southwest of the GPS coordinates at the intersection of SR 235 (Otsego Pike) & Cygnet Rd. J. O. Haney was the town’s first postmaster. He was succeeded by John H. Cochrel (1858 – 1912) who opened up a grocery store in 1894. John was buried with relatives in Old Maplewood Cemetery on the south side of SR 18 (Briar Hill Rd) in North Baltimore. Willard E. Beal (1862 – 1946) was the last postmaster & was laid to rest in Bethel Cemetery on the east side of Rudolph Rd in Rudolph. Description: Originally called Lawrence, Bassett was on the Cincinnati, Hamilton, & Dayton Railroad. It was named after the family of B. A. Lawrence & Elisabeth (Rosen) Lawrence who owned a steam-powered saw mill in the southwest lot of the intersection & donated land for a train station in the late-1800s. B. A. Lawrence struck oil in North Baltimore in 1889. He was also vice-president of the People’s Banking Co. & served as township assessor. Sometime around 1900, the town name changed from Lawrence to Bassett. The current Slippery Elm Trail is part of the Wood County Park District & is a 13 mile paved recreational path along the former railroad bed. Description: The town was named after William Lovett who donated land for the first Seventh-day Adventist church in Ohio. It was constructed in 1864 & was moved to Bowling Green at the intersection of S Enterprise St & Lehman Ave in 1911. Lovetts Grove also had a steam-powered saw mill & a school west of the GPS coordinates in the southwest lot of the intersection of Bishop Rd & Brim Rd. Peleg G. Thomas was the first postmaster. He was succeeded by John T. Sweet (1826 – 1892). John was buried with relatives & other residents of Lovetts Grove 2 miles northwest of the GPS coordinates in Union Hill Cemetery on the east side of Brim Rd. Description: It was platted in 1835 by William Fowler & George W. Baird (1804 – 1856) who operated a saw mill, hotel, & a general store at the site. The town was named after Milton Baird (d. 1833). Epaphroditus Foote (1791 – 1857) from New London County, Connecticut was the first postmaster & served in several township positions. He was succeeded by William Ewing (1812 – 1895). Miltonville was passed up by the Dayton & Michigan Railroad in the mid-1800s, but continued to maintain its existence well into the early-1900s. George Baird & William Ewing were laid to rest in Fort Meigs Cemetery on W Indiana Ave in Perrysburg. Epaphroditus Foote was buried with relatives in Otsego Cemetery 5 miles southwest of the GPS coordinates on the south side of SR 65 in Washington Township. Description: Montgomery Cross Roads had the first post office in the township. Guy Morgan (1785 – 1842) from New London County, Connecticut was the first postmaster. He was buried with relatives in Riverview (West Millgrove) Cemetery about 4 & 1/2 miles south of the GPS coordinates on the south side of Sandusky St (Township Hwy 3) in Perry Township. One of Guy’s sons, Ezra Morgan (1821 – 1862), took on the postmaster position after he passed away. Ezra moved out of the state & was buried with relatives in Dewitt City Cemetery on the east side of N Bridge St in Clinton County, Michigan. George B. Hedge (1819 – 1905) from Merrimack County, New Hampshire & Catherine (Crawfoot) Hedge (1829 – 1896) from Cuyuga County, New York were the last proprietors. George was the postmaster & operated a steam-powered saw mill until 1889. Their sons operated a brick & tile works on the east side of McCuthenville Rd north of the GPS coordinates. The Hedge family was buried in Graham Cemetery on the south side of Graham Rd (Township Hwy 167) between Wayne Rd & Pemberville Rd. Description: It was on the Toledo, Columbus, & Cincinnati Railroad (later the Toledo & Ohio Central Railroad) & was named after an abundance of oil in the area. The town had a school (Bloom Township No. 4) in the northwest corner of the intersection of Oil Center Rd & Bushey Rd & a steam-powered saw mill owned by the Bushey family south of the school on the east side of Bushey Rd. The Ohio Oil Company, Buckeye Pipeline Company, & Standard Oil ran the oil interests around town. Its necessary holding tanks became the namesake of Tank Farm Rd. Civil War veteran James W. Eidson (1847 – 1917) was the postmaster. He was buried with relatives in Oak Grove Cemetery on E Merry Ave (96) in Bowling Green. Wood county was the center of northwest Ohio’s oil boom which lasted from about 1885 – 1915. However, operations at Oil Center went on for several decades after that. The Wood County Historical Center & Museum is 11 & 1/2 miles north of Oil Center on County Home Rd in Bowling Green & features an outdoor display with an oil rig, buildings, & other equipment related to the industry. Description: As with Miami (Maumee) in Lucas County, a settlement was made next to Fort Meigs in Wood County following the close of the War Of 1812. It was at the former site of Port Miami of Lake Erie, a town founded in 1810 & abandoned at the start of the war. The new town called Orleans, named after New Orleans in Louisiana, was surveyed by Seneca Allen & had hopes of becoming the “Orleans” of the north. Travelers settling in Wood County or heading further west used the town as a temporary stopping point & some ended up staying longer. Orleans wasn’t a great place for landing boats though & its proximity to the river was a big problem with recurring floods sweeping through the village. Perrysburg was subsequently platted on higher ground in 1816. Most of the residents of Orleans moved there by the mid-1820s & there was only a couple of families left after that. Description: It was founded by William B. Potter (1819 – 1903) from Nottingham, England & Clarissa (Shipman) Potter (1830 – 1887) who moved to the area in 1864 & had 10 children. The town had a school (Weston Township No. 5) in the northwest corner of the intersection on land donated by Solomon Hook (1818 – 1897) from Beaver County, Pennsylvania & Margaret (Hersh) Hook (1826 – 1902) from Columbiana County. There was also a steam-powered saw mill next to Beaver Creek on the east side of Wapakoneta Rd & a Lutheran church at the cemetery. Carl Bachman (born c. 1828) from Germany was the only known postmaster. William & Clarissa Potter were buried with relatives 4 miles east of town in Weston Cemetery on Van Tassel Rd. Solomon & Margaret Hook were laid to rest in Beaver Creek Cemetery 3 miles northeast of the GPS coordinates at the intersection of Beaver Creek Rd (Township Hwy 203) & Poe Rd (Co Rd 78). Description: The town was named after the Prentice family in the area & had a train station on the Toledo, Columbus, & Cincinnati Railroad (later the Toledo & Ohio Central Railroad) in the late-1800s. Some members of the Prentice family were buried in Lake Township Cemetery 5 miles southeast of the GPS coordinates on the north side of Walbridge Rd (68). Sometime around 1900, the town name changed from Prentice to Whitmore after the family of Waters Whitmore (1817 – 1884) from Massachusetts & Susan (Consaul) Whitmore (1826 – 1897) from New York. One of their daughters, Sophia A. Whitmore (1850 – 1934) continued to own 25 acres of land along the west side of the railroad tracks stretching from E Andrus Rd to Wales Rd. The Whitmore family was laid to rest in Willow Cemetery about 3 miles northeast of the GPS coordinates on the north side of Pickle Rd in Oregon, Lucas County. Description: Riverdale was on the Cincinnati, Hamilton, & Dayton Railroad in the late-1800s to early-1900s. Description: It was on the Lake Shore & Michigan Southern Railroad near the Wood & Lucas County border in the late-1800s to early-1900s. Description: Samuel Heller (1797 – 1852) from Monroe County, Pennsylvania was the postmaster & owned the farm on the north side of the GPS coordinates. The town faded out of existence after the post office moved. Samuel was buried with relatives about 9 & 1/2 miles southwest of the GPS coordinates in Pleasant Hill Cemetery on the south side of Allen Township 109 in Portage Township, Hancock County. Description: Ross Creek was founded by Robert Mackey who built a general store in 1836 about a 1/4 mile northwest of present-day Mermill. The store caught fire the following year & Robert subsequently moved, leaving behind the dream of starting a successful town. Description: The town was founded by Eli Stockwell (1856 – 1931) from & Mary (Cookson) Stockwell (1858 – 1904) from Hancock County. They got married in 1876, moved to Wood County in 1881, & had 5 children. Eli built a steam-powered saw mill on their 80 acre farm in the northwest lot of the intersection & drilled 3 oil wells on the property in 1887 – 1888. Stockwell also had a cider mill in the lot on the northeast side of the GPS coordinates & a school (Liberty Township No. 8) in the southeast lot of the intersection of Bays Rd & Liberty Hill Rd. John F. Carmody was the postmaster. Eli & Mary were buried with relatives about 6 miles north of town in Sargeant Cemetery on the north side of Powell Rd between Rudolph Rd & SR 25. Description: Webb was on the Northwest Ohio Railroad (later bought by the Pennsylvania Railroad) & had a stave factory on the north side of SR 163 east of the railroad tracks on land owned by Richard Moll. A. R. Mathews was the postmaster. A school (Troy Township No. 8) was on the east side of Bradner Rd on the south side of Packer Creek. Peter Manor died the next year while in the process of rebuilding his mill. Isaac Ludwig (1813 – 1906) & his wife Christenia (Ness) Ludwig (1819 – 1903) purchased the mill & completed its construction. Providence was hit by the cholera epidemic in the early 1850’s & the population decreased again. Then it lost its post office which ran from 1836 – 1868. The town never had a railroad station & the closing of the canal was pretty much the last straw for Providence. Lucas County removed it from their recording list in 1928, basically turning it into a ghost town at the time.